Monster hunters meet man eaters in an epic standoff! Visit some of the world's greatest cities and defend them from massive monster invasions with a powerful arsenal of weapons - or take on the role of the monster and show the humans who's really at the top of the food chain. Play as a man: The people of the world need a hero in these dangerous times, and monster hunting happens to be your specialty. No monster is too big when you can fly into the sky to meet them face-to-face with a jetpack - and even the toughest of foes can't ignore your tanks, helicopters, turrets and other defensive weaponry. Save civilians and maximize the number of undamaged buildings to earn cash. Play as a monster: Stomp your way from Amsterdam to Tokyo blowing fire, eating civilians and generally doing what monsters do best - wreaking havoc and mayhem! Destroy buildings and enemy units, collect treasure and eliminate the human cities to collect as much cash as possible. The Man might have tanks - but what is a little tank going to do against your awesome tail spins, toxic dumps and spider minions? 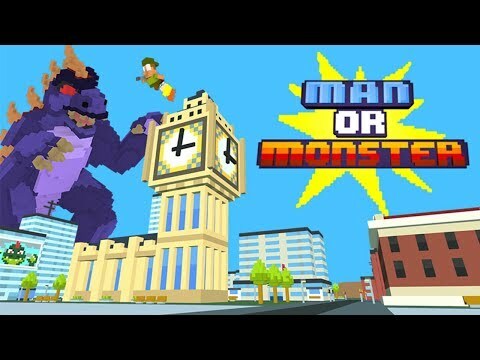 Are you a man...or a monster? Play now and make your choice!